With iHost, it possible to self manage all aspects of your web hosting and email accounts in real-time, using just your web browser. This puts you in TOTAL CONTROL! We offer two types of hosting control panel, which are dependant on what hosting plan you are on. Details of our two hosting control panels are below. Our Starter, Silver & Gold Web Hosting Plans, come with CPanel™. CPanel™ is the worlds leading Control Panel, and one of easiest and most widely used hosting control panels there is. 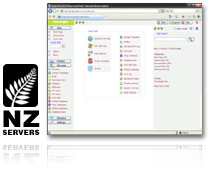 Our Corporate & Business Web Hosting Plans, come with a new powerful New Zealand developed Hosting Control Panel, that has been specially developed for this particular hosting network. Available on most of our our CPanel Web Hosting Plans. CPanel comes with a number of different statistical programs to allow you to view your website stats, including AWStats. AWStats is a short for Advanced Web Statistics, a powerful comprehensive website statistics programme, that can be used to analyse your website's performance. Click here for more information about website statistics. Setup email boxes when you want, in real-time! You can also setup your email to forward to other mailbox account. The email console also features webmail, allowing you to check your email wherever you are in the world! With the folder browser, you can setup folder permissions, and password protect certain folders.